Torah Philosophy: Israel – Holocaust 2.0? Recently there has been a great deal of discussion about the Israeli settlements in the West Bank. In fact, President Obama has committed himself to creating a Palestinian state. This Palestinian state would presumably include the West Bank more or less up to the 1949 armistice line also known as the Green Line. That would put the Palestinian state to within 14 miles of downtown Tel Aviv, within easy range of the type of 122 mm Katyusha rockets used by the Hezbollah against northern Israel in 2006. In other words, President Obama has committed himself to forcing Israel to accept indefensible borders. The truth is that according to international law, the president seems to be correct. The State of Israel was in effect created in 1947 by UN Resolution 181. This resolution did not grant Israel the territory now known as the West Bank or Jerusalem. Following the Six Day War, the United Nations passed Resolution 242 requesting the “withdrawal of Israel armed forces from territories occupied in the recent conflict”. Therefore, by law, Israel must evacuate the West Bank and Jerusalem. By international law, Israel was created with indefensible borders and by law it must remain within those borders. Apparently, if this will lead sooner or later to the destruction of Israel, Israelis must simply accept this. This is international law according to the United Nations. What occurred to me recently is: What exactly did the United Nations intend by creating Israel in the first place? Did the member nations sincerely believe that, like two peas in a pod, the Islamic state of Palestine and the Jewish state of Israel would co-exist peacefully now and forever? The 1936–1939 Arab revolt in Palestine, which cost about 5,600 lives, and was organized in protest against Jewish immigration, should have indicated that this would be impossible. Furthermore, Muslim reaction to Resolution 181 was uniformly negative. There does not seem to be any precedent for separating two belligerents with such a convoluted border. So what was the United Nations thinking? I hate to ascribe malevolent motives to people unfairly, however it would almost seem as if the United Nations decided to resolve the problem of Holocaust survivors, who were in 1947 mainly residing in displaced persons camps in Germany and Austria, by herding them into a death trap in Palestine and then letting the Muslims finish them off. In reality, as we know, this horrendous outcome did not come to pass, however the United Nations remains committed to its original program, of locking as many Jews as possible into a situation where they will ultimately be killed off. For the past 60 years, Israelis have hung onto survival by their fingernails, mostly by ignoring the United Nations. When and if the United States fully commits to implementing international law, it would seem that Israel will be in dire jeopardy. As an aside, it was terribly irresponsible of the majority of Jewish leadership in 1948 to have accepted the partition plan. The wisest course would have been to embrace the UN trusteeship of Palestine as proposed by the United States. Anyone responsible for the partition, whether directly or indirectly, was guilty of criminal negligence at best, genocide at worst. Unfortunately, Zionist leaders, hungry for power, opposed the trusteeship. Blood is on their hands. Today, we can only repent and pray fervently for a peaceful resolution and the speedy coming of the Messiah. i love how just below this presumably anti-zionsitic gobbledygook ,you have a picture of a jew saying shema at the kotel, which would fall under arab lands, according to your solutions. "a jew saying shema at the kotel"
The point of this post is that there is a widespread misconception that in 1948 the UN created a Jewish state in Palestine. That's not true. 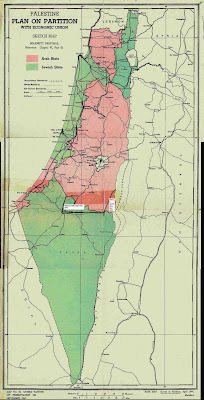 The UN created two states in Palestine - a Jewish state and an Islamic state intertwined together. Considering that all surrounding states were hostile Islamic states, you don't have to be a genius to guess what the outcome is going to be with that. >>>you don't have to be a genius to guess what the outcome is going to be with that. We're not all geniuses, even though most atheists are smarter than avarage. But please tell us what the outcome is going to be with that? "For the past 60 years, Israelis have hung onto survival by their fingernails, mostly by ignoring the United Nations." However you are correct that malignant UN leaders were looking for a quick solution to the Jewish problem and arab blood was a small price to pay for them to absolve themselves of the giult of the Holocaust. However this rosy-cheeked "Jews were always innocents in this whole mess" scenario you are advocating is just not realistic. "I hate to ascribe malevolent motives to people unfairly,.."
The partition of Palestine could have been like he partition of India. Not exactly peaceful between the two states but not a holocaust either. In the case of India, the Hindu population is so huge that they are not in danger of extermination. In regards to Palestine, the Jewish state was created as a tiny, convaluted fragment in a sea of Muslims. Without the support of the US in ignoring the UN, I don't think it has much chance. You seem to be in the business of predicting the future or positing alternative outcome histories. You are not any more convincing than those who predict a holocaust in America. This is nothing more than the bitter whining of a heredi community who actively opposed the Zionists and took the wrong side of history, and is now attempting to justify it. "heredi community who actively opposed the Zionists and took the wrong side of history"
Other than Israeli politicians, bless their souls, who exactly has gained from the creation of Israel? You still havn't told us. What is the outcome going to be ? Abe, don't worry, trust God. The only thing you need to do is repent and pray fervently for a peaceful resolution and the speedy coming of the Messiah. "Other than Israeli politicians, bless their souls, who exactly has gained from the creation of Israel?" Who gains for any country? The people that live in it. Maybe more would still be alive had they lived elsewhere. JP, you can give a better answer to Anon1 than one that starts with "maybe." jp, have you had the privelage of visiting Israel? I lived there for nine years. >>>The only thing you need to do is repent and pray fervently for a peaceful resolution and the speedy coming of the Messiah. But what you're doing is asking me to trust you. We can't trust you to do that. You still havn't told us. What is the outcome going to be? Is there something you don't want us to know? Pray and repent. That's all we can do. >>>Pray and repent. That's all we can do. What atrociously, awful activities were you involved in that requires so much prayer and repentance? I might not be trying hard enough to stop atheism. It appears that you're not succeeding. Islam and Mormonism are ensnaring almost as many minds to their god as kosher water filters are capturing copepods. You need to reach god in a more effective manner. Go retrieve your boning knife and emulate akaydas yitzchok. You may yet get god's attention. "It appears that you're not succeeding." "Go retrieve your boning knife"
Abe, I'm glad you're ready to volunteer for human sacrifice. I've got the knife out; just send me an email. It won't hurt a bit. "Today, we can only repent and pray fervently for a peaceful resolution and the speedy coming of the Messiah." But our moshiach has already come and his name is Moreinu Rav Menachem Mendel Schneerson. YECHI ADONEINU MOREINU VERABEINU MELECH HAMOSHIACH LEOLAM VOED ! !